Palatine Tiger Sharks Swim Team is a multi-ability-level program that offers competitive opportunities, technique development, and fun for swimmers ages 6 and older. The swim team is divided into progressive groups with open tryouts held twice a year (in spring and summer). 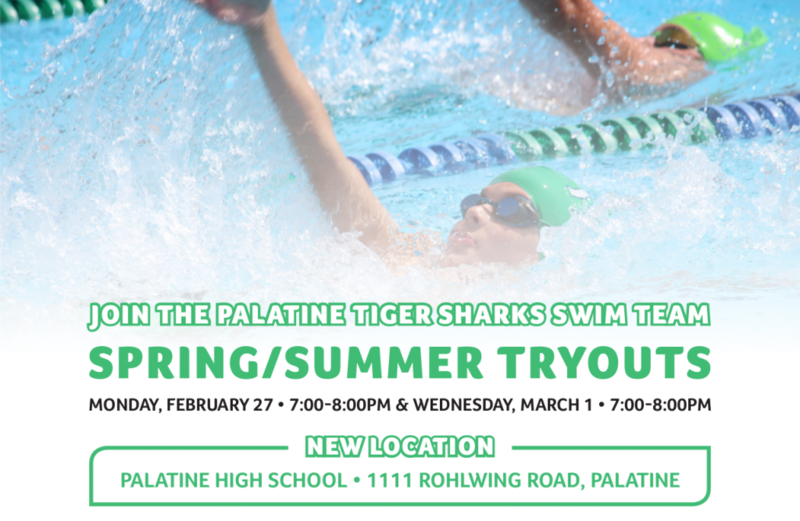 Interested in joining the Palatine Tiger Sharks? Come out to tryouts on Monday, February 27 or Wednesday, March 1 between 7:00-8:00pm. Swimmers are to arrive at the pool anytime during these designated tryout hours. Swimmers will be evaluated for 5-10 minutes. Bring a swimsuit, goggles, and a great attitude. The Palatine Park District Tiger Sharks are a USA Swimming affiliated club just like any team that cometes in the Olympmic Trails. Our coaches are all American Swimming Coaches Association certified and bring great enthusiasm to every practice. If you have any questions or are unable to attend the tryouts, please contact Coach Dustin at ddt1326@yahoo.com.